AURORA ALERTS: Did you miss the Northern Lights of August 9th? Next time get a wake-up call from Space Weather PHONE. SHENZHOU 7 UPDATE: China's Shenzhou 7 spacecraft has landed. The reentry capsule carrying three taikonauts parachuted safely to the grasslands of inner Mongolia on Sunday, Sept. 28th. "There is a lot of complex motion visible within the prom's structure," he adds. Indeed, this animation created by Emiel Veldhuis of the Netherlands shows some of the motions readily visible through backyard solar telescopes. From bottom to top, the dynamic structure measures a whopping 10 Earth diameters high. 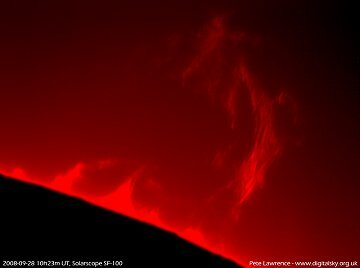 If you have a solar telescope, take a look. DOOMED SPACECRAFT: The Jules Verne robotic cargo carrier is making its final orbits around Earth. On Monday, Sept. 29th at 1330 UT, mission controllers in Europe will command Jules Verne to plunge into the atmosphere above the South Pacific Ocean where it will disintegrate in a blaze of light and heat. "Yesterday evening, I saw Jules Verne for the first and possibly last time flying solo in the skies over Germany," reports amateur astronomer Dirk Ewers. "It was flying about 30 minutes behind the International Space Station, and I video-recorded both using a 5-inch refracting telescope." The movies are must-see. First, download the free DivX video compressor. Then, click here and here to play the flybys. 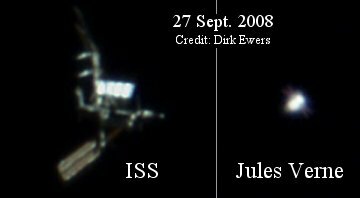 Compared to the ISS, "the Jules Verne is really small, but on the video you can see its four auburn-colored solar panels with a width of only 1 meter," notes Ewers. On Monday, auburn turns molten red. Two NASA aircraft and possibly the ISS itself will be positioned to observe the fireball. Follow the action at the ESA's Jules Verne blog and stay tuned for photos from the South Pacific. On September 28, 2008 , there were 982 potentially hazardous asteroids.